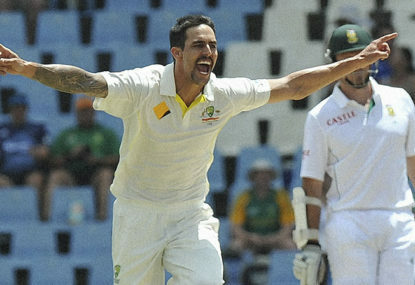 In the space four months Mitchell Johnson has gone from a derisive selection in the Australian Test team to the most valuable player in the longest form of the sport. In the space of six Test matches he has been the major catalyst in Australia’s cricketing resurgence, claiming man-of-the-match honours in four of those encounters. Having just completed his 57th Test he now boasts 254 wickets at 27.5, having gone past Graham McKenzie (246) and Richie Benaud (248) at Centurion to sit seventh overall in Australia’s list of leading Test wicket-takers. Anyone who thought Johnson’s demolition of England on home soil – 37 wickets at 14.0 – was a one-off, need think again. On a relatively benign pitch at Centurion he returned career-best figures of 12-127 as he cut a swathe through the number one ranked side in the world. There is no doubting that in his current form – 49 wickets at 13.1 in his last six Tests – Johnson is currently the premier bowler in the sport. Few in history can boast such devastation over such a short period. And it is not just the number in the wicket column that has been the barometer of his performance. Johnson has intimidated and he has done it as well as any fast bowler in the history of the game. The first Test in South Africa is testament to that. Early in Hashim Amla’s knock in the Proteas’ second innings Johnson hit him flush on the grill of his helmet while he curtailed play for five minutes on the cusp of tea on the fourth day when another bouncer clattered into Ryan McLaren’s helmet opening up a wound behind his right ear. The psychological blows landed by Johnson at Centurion will be difficult for South Africa’s batsmen to erase from their minds before they have to butter up again at St George’s Park. At times in the past half a dozen Test matches Johnson has appeared to be as modern-day Gulliver against a Lilliputian XI. His constant menace has caused havoc with batsmen’s technique and shot selection. His all-out onslaught has been backed up by some sensational fielding that has produced at times dismissals that simply make you shake your head. If there is one batsman above any other in the South African line-up who knows full well the physical damage that the broad-shouldered quick can wreak it is the skipper, Graeme Smith. In the space of three Tests in early 2009 – Sydney and Durban – Johnson twice broke Smith’s fingers with spiteful spitting deliveries. In that Durban Test he forced Jacques Kallis to retire hurt having struck him a sickening blow on the helmet – it was one of the few times the champion all-rounder was struck in the head in his long and illustrious career. Once renowned for his scattergun approach which often saw overs sprinkled with wide deliveries either side of the stumps, Johnson has now become a far more controlled and heady bowler. One of the recent additions to his armoury has been the regular switch from over to around the wicket and back again. The change of angle and the alterations needed to his approach and follow-through each time he changes sides has not seen any dilution in his ability to hit the right spots. Over the space of the recent five-Test Ashes series is was evident that the initial onslaught that Johnson wreaked upon England’s batsmen in the opening encounter at Brisbane played havoc with their minds for the remainder of the series, so much so in fact, that at times they resembled rabbits trapped in the glare of a vehicle’s headlights. This current series is shorter – just three matches – and having sustained a massive 281-run loss first-up South Africa has to find a way of blunting Johnson’s dominance prior to the next Test at Port Elizabeth which starts on Thursday. Failure to come up with an effective plan will likely see the Proteas lose their first series in 15 starts. Of course it is one thing to formulate a plan, another to put it into action. There is no doubt that Smith and the Proteas’ brains trust would have been paying close attention to the Ashes series so it was not as if they were not forewarned of the challenge that was about to confront them. Yet, despite that warning and sufficient time to work on the technical and mental requirements needed to nullify Johnson when it came to the crunch they impersonated lemmings much as England’s batsmen had. Johnson has been ably supported by Ryan Harris, Peter Siddle and Nathan Lyon this southern summer but that trio have been very much a support act. Johnson entered the Australian summer outside the top-30 ranked bowlers in Test cricket. He went into the Test at Centurion at number nine and will surge into the top-five if his form holds through the next two Tests in the Republic. The South African pair of Vernon Philander and Dale Steyn may well be ranked number one and two respectively at present but over the past four months Johnson has out-bowled them and by a considerable margin. Michael Clarke has at his disposal a one-man weapon of mass destruction. Johnson has broken bats, stumps and hearts in recent months and it shows no signs of abating as cyclone Mitch heads in a south-westerly direction to Port Elizabeth. The locals had better batten down the hatches. After 21 years as a sports broadcaster with the ABC, Glenn Mitchell has been freelancing in the electronic and written media since mid-2011. He is an ambassador for mental health in Australia.